Last week, in a podcast with lovely comedian Richard Herring, Stephen Fry felt comfortable enough to speak with further candour about his ‘bi-polar life’. Confessing that he had only last year attempted suicide, he went a little further than he has previously done, giving us another intimate instalment of his condition – a duty he takes seriously as the president of charity Mind. It was shocking to hear of such an act, but perhaps more so of such recency; you always naively hope, despite his frankness about his lows, that he has conquered the demons since his famous breakdown of 1995, which saw him walking out of a West-End play to sail for Belgium, (as good a place for dark thoughts as any). It is something I remember vaguely from the news while I was staying at my Dad’s bungalow in North Wales. I naturally thought it was sad, but it didn’t touch me then as much as it touches me now. My Dad had bi-polar. At least that was the label that was given to him and which best-fit, which is a scientific salve to me now in the constant puzzle-solving that comes from losing someone you love to suicide. The cold hard facts become a kindness alongside the searing cruelty of too many questions. When I was 23 my Dad hanged himself, a method he turned to after superficial attempts with pills and razor blades failed. He was found in a doorway with headphones on. Cat Stevens in the CD player. I trawl those lyrics even now, a decade on, for a satisfying goodbye note. Coincidentally, the last place he travelled to was Belgium, a couple of months before. He went on a recuperative day trip with a coach-load of people he had been with in a local mental hospital; a charity event in which I am surprised but glad his lofty pride allowed him to participate. What did he think as he walked around Bruges? Did he know? Was he saying goodbye to the world? Dad had always struggled with dark thoughts. He was found by his mother with his head in a gas oven aged 13. He considered (and threatened, and perhaps attempted) it many times after that. He experienced the ‘massive highs and miserable lows’ that Stephen has described. He had the characteristic extravagance that is common to manic depressives, resulting in a lifelong dance with crippling and often criminally fraudulent debt. He was a plotter, a calculator, a control freak. At times in his life he was alcoholic, manipulative, violent, and to some pretty damn evil. He was also charming, vibrant, cheeky, eloquent, highly intelligent, witty, and would give you the shirt off his back. He once anonymously paid off my best friend’s overdraft, he once sat with a very troubled man for hours talking him out of going and indiscriminately shooting people. He was adored, dreaded, loved, feared, tolerated, yearned for, and immeasurably grieved for. His funeral book bore thanks from people for the countless kind things he had done, and for being the reason one old friend was still on this earth himself. He was celebrated for his joyfulness. The service was moved, to our surprise, from the small chapel to the big chapel because so many people turned up to pay their respects. He was all things. I was always – even later, in the more difficult times – so proud of him being my Dad, or Papa as he liked to be called, the twee bugger. It still rankles my gut that he never gave medication a chance. I think he was afraid of losing control; of his sharp mind being blunted; of his pursuers catching up with him; of, dare I say, prison. In 2003, aged 57, he ‘finally went and did it’. Those were the words poor Mum had to use to tell us; the words of no surprise. In October it will be ten years. I cannot begin to describe in one column the various landscapes of my mind in those ten years. 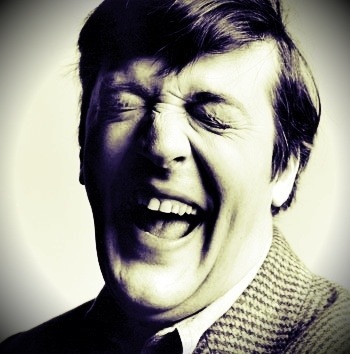 I met Stephen once, in the make-up room at ITV while I was watching a dear friend get ready for a QI record. He was charm personified, said hello like I was a favourite niece though he had no idea who I was, and I watched him being powdered quietly from the corner. Here was the nation’s darling, but for me he was so much more. He was all the things I loved about my father, still walking around, alive. The gentle poshness, the brilliant articulacy, the bright and beautiful mind, the dapper jackets and coloured socks peeking out. The aura that life, perversely, is wonderful. Bi-polar. It’s such a strange beast to understand. I won’t fathom it here. So mysterious a thing is it that my Mum, Dad’s best friend for many years, isn’t even sure that he had bi-polar rather than some other sort of personality disorder. There is scant ‘knowing’ with it. Certainly not for those who don’t have it. And it is a constant question running alongside my own moods too. Only yesterday I had the shadow flit through in a moment of sadness; I could end it right now. Could. What a word. What a burden. I don’t think I am bi-polar, at all. I would not insult its true sufferers by supposing my highs and lows are anywhere near theirs in scope. But having had suicide in your life ushers in the possibility of it, while at the same time taking it away. You fantasise about it, but you (think you) know you will never do it. As Stephen said, you picture the faces of those who love you. That prevents you. I think my lows, my hopelessness, have mainly been born out of a very long grief, but when it’s all suicide-tinged it’s sometimes hard to tell. I feel plagued by unknowable genetics, yet I sometimes conversely crave similarity to the man I lost because even his bad traits are better than none. I keep him alive however I can. Like many people I so admire him for his honesty, but am also more grateful for it than I can express. I borrow from him the sense I cannot always find; the lessons that my pain – at times renewed afresh – sometimes makes me forget. I love him, and thank him, and hug him in my mind for all the bleak moments that might yet come to him. And smile, with a smile that holds more than anyone will ever know, at his socks. His lovely, colourful, hopeful socks. Very very well said. Bless you. I have the same condition as Stephen. It’s great to hear you remember your father with so much love. I’m struggling a little bit at the moment but standing strong. Absolutely beautiful piece. Both of my parents have suffered with depression in different forms and it’s nice to see someone talk about mental health issues so openly. Utterly beautiful, and I think it takes a much stronger person to admit there’s things they do not know, or cannot truly empathise with, than to assume they do or can. And much skill to make something so complex, accessible. Beautiful piece of writing. Very humbling, in all the right ways. Reblogged this on Too Posh To Mosh. Beautiful and sensitive. Justly elevated. Thank you for the warmth and openness of your words, Sadie, and so sad for your loss. I do know what you mean, growing up with suicides in my family, losing my younger sister to alcoholism and grieving for her still. I have major depression and find it hard to write about the “milder” lows with which I struggle. Thanks for your lovely writing, be well. Thank you for sharing such a personal and beautiful piece! I’m glad that you are able to find comfort rather than resentment in someone who reminds you of your father. I admire your ability to accept what you may not understand, and to admit that you do not understand it. Sending lots of love! PursuingREAL has said what I would like to say and has said it beautifully so I shall just concur. Quite beautiful. Painfully so. Thank you for your sharing, and your exquisite writing. What a beautiful blog … deeply moving. This is a lovely thoughtful piece. Thank you. Thank you for sharing in such an intimate expansive way, illuminating the darkness we experience here with so much love. i´m bipolar myself and have been since 26; i´m 49 aged now and have been in hospital so many times, have had my ups and downs that I can talk about it openly now, I feel like an ave fenix always on the verge, on the edge of life: the higher I get the lower I´ll fall. For me, the only hope now is to maintain a kind of inner balance between who I´m really am and the outer world, always trying not to lose the connexion that keeps my spirit in toch with this world and its forms. This was amazing, honestly writing in a beautiful poetic way. I applaud you and wish you the very best. I did not know that about Stephen Fry. Brilliant write up. Thanks for sharing. This is such a wonderful, well-thought-out post, and incredibly touching. Brilliantly written. I am sad for your loss. I don’t think I have bi-polar, but I am a moody person. I don’t think this gives me any insights into this condition. In fact, every sufferer experiences bi-polar differently from the next person with bi-polar, which is why it can be so difficult to understand them, let alone help them. Beautifully said! Bravo and Best Wishes! This is such a touching piece. I always find Stephen to be a source of comfort to me whenever my own condition gets bad. I often look up videos of him on youtube just so I can hear the beautiful, sweet, cheerfulness of his voice. Would somebody tweet this article to Stephen? I think he’d like to read it. I can feel your pain through your writing. Well written! My best friend struggles with bi polar disorder. It is comforting to feel like there is someone else who can understand what it is like to be in the life of someone you love who is ailed this way. Tank you for sharing your story. Hi my name is Ginger & your blog touched me in a big way, and Im sorry to hear about your dad. I can relate on both sides, the suicide and losing family that way. I understand how it must seem that people who take there lives are selfish but the fact is that until someone lives with mental illness they can never really understand this battle. Its like being in war against yourself, cause after so many years of suffering and feeling like a switch keeps being flipped inside your head from normal, high, & a crash so bad it feels like your private hell alone in your head. Im still fighting this everyday and just want to say that your blog made me feel not so alone. I too struggle with bi-polar and I am so sorry that someone you love was affected too. Thought provoking and heart-wrenching, yet hopeful and forward looking. Thanks for sharing such an important and personal story. I am deeply touched with the way this article is written, it is filled with love but also darkness and it makes me sad and happy at the same time. I really enjoyed this piece. While I am familiar with Stephen Fry, I was unaware of his bi-polar status. Thanks for writing such a beautiful piece. Beautifully written and so sad. I feel for your loss. Life can be difficult at times but believing in success can shine your light to more! Follow me for Motivation throughout the day! I believe in motivating the world and with motivation i bring you support and you inspire positive change! Allow your mind to venture off to the unknown. Thank you for sharing your story. I now have a better understanding of the illness and how it affects families. Somebody close to me suffers from BP and unless you have witnessed it, it is difficult to comprehend how rehabilitating it is. This is such a great post. We need more of them to educate those who are not properly informed. To suffer the hell’s of poor mental health is the worst. I don’t have personal experience, but I have gone though it’s tortures with my youngest son, he many attempts to take his life, mostly to ask people to see his pain, but twice because he felt beaten. Stephen Fry is a wonderful champion for Mind, his frankness of his personal experiences can only help kill the stigma. What a beautiful article, and so well written. My condolences to you and your family. My brother suffers from depression and bi-polar, so I understand how hard it is to really look after the person you love, and how wonderful it is when someone truly understands what they’re going through. Thank you so very much for this amazing expression. I am very grateful, that someone is able to voice the anguish so many of us go through. I am reading this and crying. I know I’ve come far to close to suicide. My grandmother killed herself and I am disabled as a result of an earlier attempt. Stephen was right when he said the wrong question is ‘ why’. As too often when you are in a black mood it is why not. Thank you for your post and remember that if you ever need help the Samaritans or your GP will listen. It’s hard growing up in the shadow of suicide and I wish you all the luck in the world. Thanks for sharing this. I have bipolar and have been suicidal, attempting three times in the past and really struggling with suicidal ideations now. Bipolar is a horrible illness I wouldn’t wish on anyone. I admire anyone who is willing to acknowledge their illness and help defeat the stigma. I really admire those who don’t have a mental illness but take the time to learn about them so they can hopefully make a positive difference for someone or have a positive impact in the fight against stigma and discrimination. I am also bi-polar, have an anxiety disorder, and deal with depression. The way you describe your dad is so close to describing me. Seeing it in print lets me know that I need more help than I am getting. All they seem to be doing is medicating me. I still have the debt, the highs, and lows and I want to be better. Thank you for opening my eyes. Beautifully written! You shared such a wonderful relationship with your Papa. Wish he’d tried medication! I find your post incredibly brave, throroughly fascinating and highly relatable, a very sensetive approach to such a topic. What a poetic and emotional post. I am very sorry to hear about the loss of your father, you must be an incredibly strong person to be able to rise above the loss and remember all of the good times. I am currently dating a man who is bi-polar. He was an alcoholic for a long time (4 years sober this July), was a party to various criminal activities, and attempted suicide. This was all before I met him, but he has confided in me about his past. This disease is a new part of life for me, never having experienced it before. For the most part he is a wonderful, caring, giving person. Sometimes he can be very dark, manipulative, and cruel. Your post helped me to understand the disease a little bit more. Thank you. This is such a candid blog post, I really appreciate how honest and heartfelt this on such a sensitive subject. It really touched me, thank you so much for sharing this with us all! Thank you so much for your post, truly touching. My dad is bipolar with schizoaffective disorder, and it has been quite the ride. I myself suffer from major depression and anxiety, and on two occasions have attempted suicide. It takes a lot to move on, and having inspirational people like Mr. Fry who live with mental illness and succeed help the rest of us know there is hope for us. Thank you again, and my heart goes out to you for your loss. I think society is designed to give us all mental health problems! There is a lack of support for mental health and too much support for pysical health. Western culture is wrong for this! Ancient civilizations understood the power of the mind before colonialism and plunder! Some people have stronger links to their emotions than others! Thank you for the sensitivity and honesty. I have a bipolar schizophrenic brother who attempted suicide years ago, and is living one day at a time now. I just wrote about it in my post “when love hurts”. It’s providential to have come across your post, just when I was thinking about the experience of loving someone who is bipolar. It’s a great comfort to find others who have had similar experiences, and have the courage to share the story. Yours is beautiful and bittersweet. I have recently been diagnosed with bi-polar disorder. In a way it was a relief to final have an answer to what was wrong with me. When I saw the movie, The Silver Lining Playbook, I started to hyperventilate and then cry, I realized watching that movie that I really had this terrible disease. But the good thing is I starting getting help. This disease is a terrible thing to live with but through talk therapy and medication I am getting better. My hope is that the stigma of mental illness with lessen with time and more people will be comfortable with getting the help they need. I was very sorry to hear about your father. I hope your good memories of him comfort you when you are missing him. Beautiful open and real. Thanks for this. Thank you for your blog – reading this reminds me so very much of my dad who also had bi-polar. How you describe your dad is also how I could describe mine, as in he could be a cheeky/charming, or also a person that some would fear (certainly when he was in his ‘violent phase’, for people that dont undertand bi-polar, or knew that he had it). Also like you, there is no anger, just a lot of love and sady, regrets too. Well done on your article, not all bilpolars are suicial and a couple of people I know that are fortunate enough to be bipolar are the most beautiful people in the world. As you get older, in a lot of cases, and maintain the same professional doctor for theoropy, and really understand this illness, you may not even require medicine any longer. People with bipolar disorder are the most caring, giving people I know. If you are bipolar, find a doctor that comes highly recommended. Learn all you can, and never be ashamed. Bipolar s are also the most creative and talented people you can find. Reblogged this on Neverassumes Blog. This is beyond beautiful. I am in love with the fact that Sephen Fry has brought out so many reactions in people, even though they can be as painful as this. But the sensitivity and strength in this is just incredible. So honest. My step-son is a bi-polar. His father started by trying to find blame in everything that he did wrong in raising him, or maybe he “got it” because he did drugs…Like he could buy it at the local store. He does well for himself with some new medicine, a job and lots of understanding. It took my husband researching it to fully understand our son’s struggles and me being diagnosed with MS another brain disorder. Unfortunately our son’s biological mother cannot accept his illness and blames it on the divorce. A very touching account of bi-polar disorder. I’m so moved, yet can barely move.I feel compelled to comment. Yet, I have nothing verbal to say. I’m going to go outside now, with my camera. Touching and beautifully written. Your Dad would be so proud. Here I present a wonderfully written account of a young woman whose father had Bipolar disease. I am in awe of your writing abilities. I am also Bipolar and can still hardly put two complete paragraphs together for a blog post. I have been very stable for a couple of years. I thank you for allowing a re-blog to my pages. Best of all to you and carry on writing. seeing how many have read your blog…amazing isn’t it…a most troubling disease…My son suffers from it…and I do mean “suffers”… at least as you say…that was the diagnosis!…But, we standing near are suffering too…some days so hard to bear!…but, we do!…for their sake …Thanks for the read and thanks for letting me spout…I needed to! so many comments on here capture it better than I could. I second it all.